Anki doesn’t think it’s cracked the code and developed the perfect robot to work at the center of your smart home, but with Vector it feels it’s created a robot adorable enough, and smart enough, to tide you over until the future finally catches up with our desire. If Vector looks familiar, it’s because the robot borrows its shape, and some of its mannerisms, from Anki’s last robopal: Cosmo. Two years ago, I developed an immediate fondness for a Cosmo, even as it made my dog so jealous he sat on it whenever I tried to play with it. The dog has since passed (RIP), and the robot, after my initial excitement waned, now collects dust sitting by the router. The only time I power it on is when kids are around waiting to be impressed. Cosmo, as cool and magical as it was, was a toy designed for a few minutes of intense play at a time. You had to tether the bot to your phone and open a menu and go through a whole process; then once you were done, you had to return Cosmo to its charging cradle and put away its accessories. Vector doesn’t have the same demands. Where Cosmo was built to be a toy, Vector was built to be the first big step towards useful robots in your home. 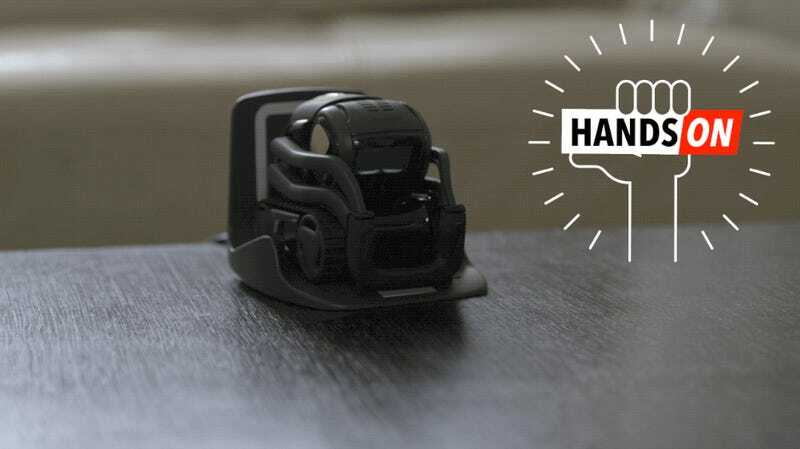 According to Anki, Vector was crafted, from the get-go, to be an always-on robot monitoring you as candidly as Alexa or Google Home, but in a much more adorable chassis. It connects to the internet, listens for your commands, and can even control your lights and other smart home products. It’s mean to sit on a mantle or a kitchen counter and wait for you to come home. Like a cat or dog, it will express excitement at the sight of you—and wariness at the sight of strangers. It’s got capacitive touch sensors so you can pat it like a pet and it will coo at the touch. Yet unlike a pet, it can also tell you the weather, or recognize your face and deliver a message left by someone else you live with. Anki acknowledges Vector is not a perfect creation and even admits that part of the reason it’s so adorable is that you’ll be less inclined to get frustrated when it messes up. Anki also acknowledges it won’t fix the many problems of the smart home or even replace Alexa or Google Home (though Anki is hoping to provide support for one or both in the near future). Instead, Vector will just be another tool in your smart home toolbox that will, hopefully, be obsolete with the release of other robots later down the line. For Anki, Vector is as much about understanding the smart home space so it can eventually deliver a truly useful smart bot as it is about making a cool gadget. Anki’s frankness over the goal of Vector is maybe what I find most appealing about the robot—Vector is a very cool stopgap, with some serious potential as a tinkerer’s toy. When it ships in October (pre-orders start now on Kickstarter), Vector will only be able to tell you the weather, give you standard facts like how many ounces are in a cup, take photos, set timers, and play a handful of games, including blackjack. There’s no music or intuitive voice assistant. Vector won’t know your schedule or field calls from your mom. Yet Vector will also have an SDK, and if it is anything like Cosmo’s, it will be incredibly robust, allowing you to do things like turn Vector into a security camera or play videos on its display. If you’re a programmer with some familiarity with Python, Vector feels like a no-brainer purchase just because of all the cool stuff you could do. For the rest of us, there’s also the gadget lust. 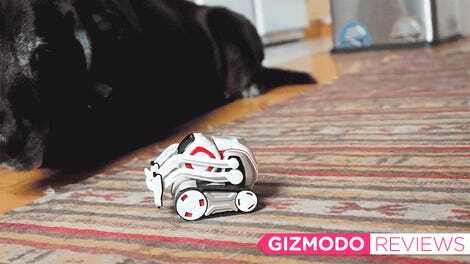 Vector costs $250, and Anki has crammed a lot of technology into the robot for that price. Instead of pairing to a phone, Vector is always on and processes your voice commands and physical interactions with a Qualcomm APQ8009 1.2GHz quad-core processor. It has a color display that allows you to customize the color of Vector’s cute little visage. It also has built-in 802.11n wifi, Bluetooth, capacitive touch sensors so you can pet it like a cat, accelerometers so it knows to get angry when you pick it up without its permission, a four mic array for listening for commands, and an HD camera with a 120 degree field of view. That’s a lot of stuff in one small robot, which, like Cosmo, can also navigate obstacles (including precipices), learn names, recognize faces, and give you a fist bump. I will admit, as silly as it sounds, it’s also really gratifying to use. There’s something about asking for a fist bump and then watching a tiny robot slowly turn, focus on me, roll towards me, and raise its little arm for a hardy knuckle tap. It immediately reminded me of those first few magic moments with Cosmo. 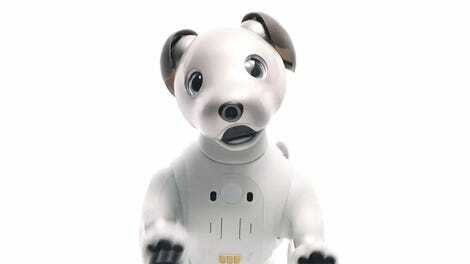 And if Anki can capture that moment and then insert it into my daily routine, teaching me to love a robot almost as much as I loved my dear departed pup, well then damn, the company might really be onto something. The Anki Vector robot is available for $50 less than MSRP on Kickstarter for the next 30 days. It will ship October 9 and be available at major retailers starting October 12.